Summary of Anthony Robbins book Money: Master the Game – 7 Simple Steps to Financial Freedom Archives - Learn to speed read in 2 day course with the top Speed Reading experts in the UK. Speed Reading courses in London, UK. Speed Reading strategies to increase reading speed, comprehension and memory. In-house speed reading courses in the UK. 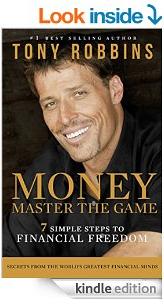 The latest book by Anthony Robbins Money: Master the Game – 7 Simple Steps to Financial Freedom, as the title promises, suggests that in 7 simple steps you can reach your financial freedom and become an investor as opposed to a consumer i.e. you won’t be trading your time for money but your money machine will work for you whether you’re working or not. Anthony Robbins (who is a great advocate of speed reading and photoreading) stresses that you should follow all those seven steps in sequence. For regular readers, this 689-page book might be a daunting task. Hence, my summary here to get you started. If you’re already a speed reader or even better a spd rdr, then you know that reading summaries has been validated as the best (and legitimate) way of getting information quickly and effectively. Anthony Robbins provides a seven step checklist for success at the end of the book which in a way summaries the book. Here it is but if you want a summary of the summary – read my final comments at the end of this blog. 1. Did you make the decision to become an investor, not just a consumer? 2. Have you committed a specific percentage of savings that always goes toward your Freedom Fund? 3. Have you automated it? If not, do it now: www.tdameritrade.com or www.schwab.com.